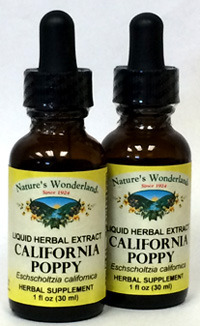 California Poppy Liquid Extract, 1 fl oz / 30ml each (Nature's Wonderland) - Penn Herb Co. Ltd.
Let the cheerful California Poppy flowers brighten your disposition and help you rest easier tonight. Add several drops of our fast-acting liquid extract to a daytime beverage or bedtime brew to calm, soothe and relax. The gentle soothing effect of California Poppy is ideal for those times when you need to quickly resolve nervous irritability, stress and tension. Its mild action can also ease occasional sleeplessness and excitability in children. Note: California Poppy is NOT the same as Opium Poppy. It is non-narcotic and non-addictive. Amount Per Serving (30 drops): Certified Organic Fresh California Poppy flowers and herb (Eschscholtzia californica). OTHER INGREDIENTS: Grain alcohol (63-73% by volume), Deionized Water. Free of : milk, dairy, egg, fish, shellfish, tree nuts, peanuts, wheat, gluten or soy. Relieves occasional sleeplessness; helps ease stress and tension; promotes relaxation; calms occasional nervousness and nervous irritability; supports calm mood; soothes temporary discomfort; eases muscle spasms; supports inflammatory response. 20-40 drops in water or juice, 2-3 times daily, or as needed. DO NOT TAKE DURING PREGNANCY. NOTE: Check with your doctor if using sedative medications.